1) First connect the modem with the Ethernet cable and connect to your PC/Laptop and power turn ON modem. 2) Open your browser and type http://192.168.1.1 . 3) Enter “admin” in username and password fields to enter the Modem configuration page. 4) Click on Wireless Menu. Select Enable Wireless. In the SSID field you can type anything to identify your network- The default SSID is “DLink”. You can change it to any Name. 7) Let the WPS in Disabled Mode. Select your SSID. 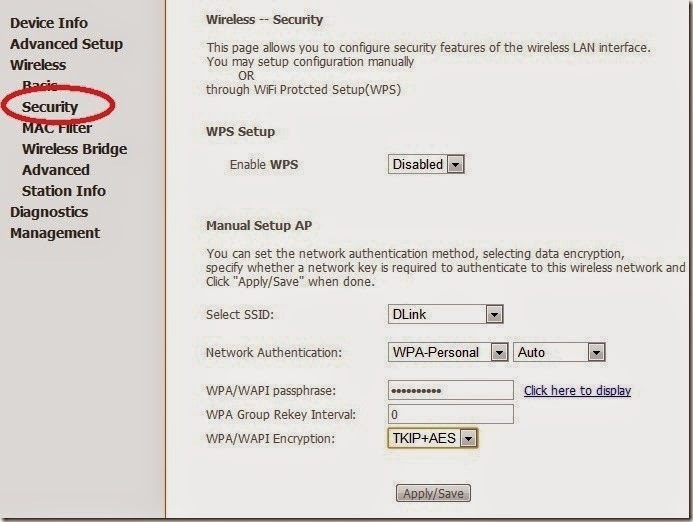 Set the Network Authentication – WPA-Personal –Auto. 8) WPA/WAPI Passphrase field enter strong password- This is your Wireless password. 9) Select the WPA/WAPI Encryption TKIP+AES or AES. And click Apply/Save your settings.